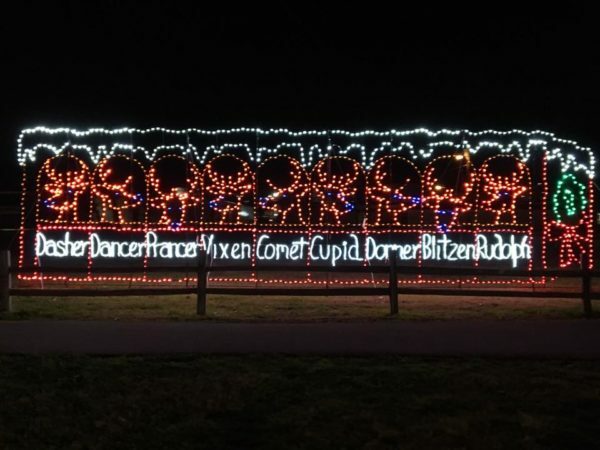 Santa’s reindeer in the stable, one of Cuero’s Christmas in the Park’s popular current LED lighted displays. Over $50,000 worth in new scenes and displays have been purchased for the 2019-2020 holiday season which opens on November 25th. It may be spring, but for the December Events Committee (DEC) there’s always something going on ‘behind the scenes’! We have just completed the final orders for several additions to the 2019-2020 season of Cuero’s Christmas in the Park. When we re-open again this November, our visitors can expect to see over $50,000 worth of new LED scenes and displays, including over $29,000 worth of scenes purchased by the public and over $21,000 worth purchased from the DEC’s own budget. We can hardly wait to unveil these additions for the holidays, and we know you’ll be excited to see them too! ← All Santa’s House Volunteer Dates Now Filled! Our 2019-2020 Season begins Monday, November 25th! All Santa’s House Volunteer Dates Now Filled!